Kwesi Kuntu, chair of the local school council for King College Prep, bangs the gavel for order at the April 27 meeting. 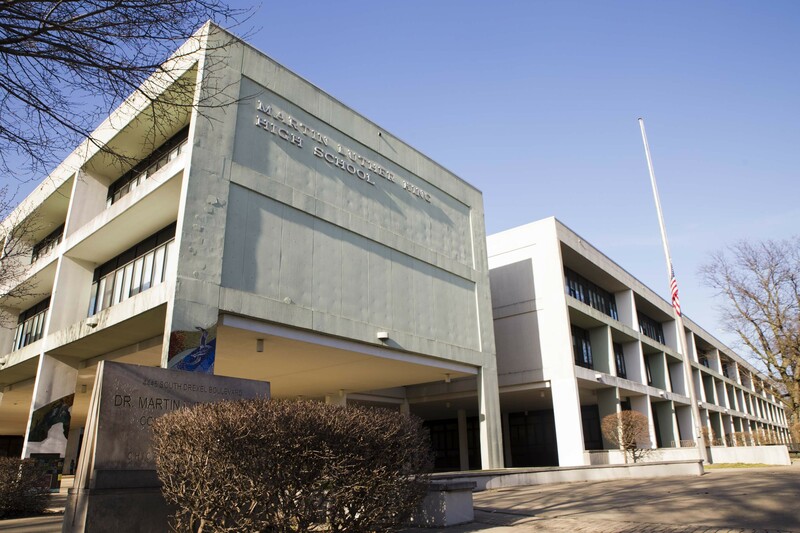 Tensions are high at King College Prep, a selective enrollment high school in Kenwood, after the school community voted in April to replace the majority of its local school council (LSC) members over its January decision to not renew principal David Narain's contract. Feelings were so strong over his dismissal that six parents and two community representatives banded together and ran as an unofficial slate in the April 19 local school council election. All eight candidates on the slate won, and three of the four sitting LSC members were voted out. The new members won’t be seated until July, however, so the current members, far from being lame ducks, remain charged with selecting the new principal. King will host a principal candidates' forum tonight. On May 7 the LSC will vote on the new principal. Critics say there was no notice of the January meeting and very little community turnout for it because Chicago Public Schools was still on winter break. Cassandra Bogan, whose daughter is a freshman at King, said she and other parents were blindsided: "We were actually in the building painting the bathrooms with the students, and no one even told us there was a meeting." Bogan said she’d learned about the nonrenewal of Narain’s contract through social media. At a meeting last Friday, April 27, LSC community representative Marcellus Moore Jr.—the only sitting member reelected—pleaded with his fellow members to include the newly elected members in the principal selection process as a gesture of "unity and transparency." "There has been disruption on both sides,” Moore said, “and this LSC should take steps to extend a hand and include the newly elected LSC." 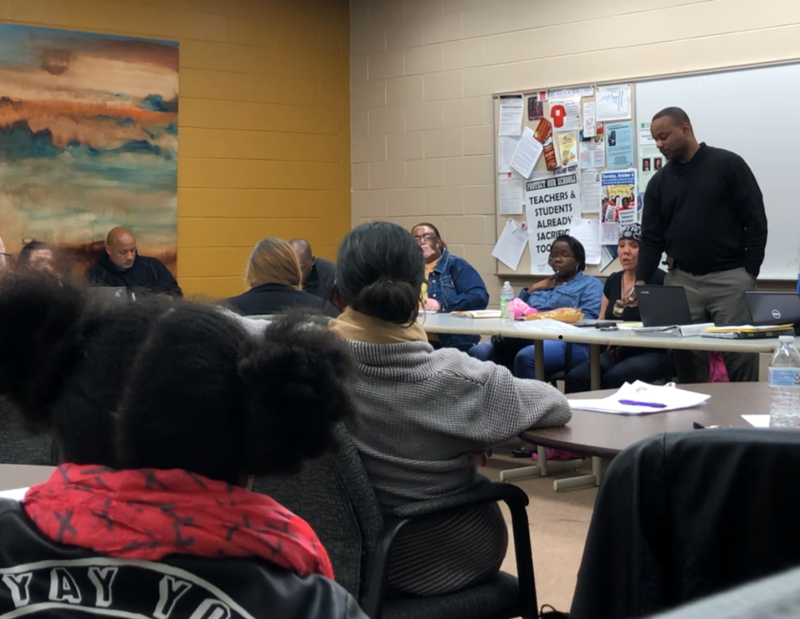 Jonathan Williams, the father of a sophomore and one of the newly elected parent representatives on the council, made his own appeal to the sitting members. "The community has sent a clear signal. I ask you to do the right thing," said Jonathan Williams. "The election results say that you should reconsider [the decision not to renew the principal's contract], and I ask you to withdraw your decision." LSC chair Kwesi Kuntu rejected such criticisms, and stated that the process has been clear from the beginning, with dates for candidate interviews and a time line set for the selection process. Following public comment, the LSC went into executive session to discuss principal candidate selection. Members emerged 90 minutes later and announced that three finalists for the job would be posted Monday after they had been notified. The official posting on Monday listed Conrad Timbers-Ausar, principal at the charter Urban Prep Academy for Young Men, Bronzeville campus; Michelle Brumfield, assistant principal at Julian High School, a Washington Heights neighborhood school; and Melanie Beatty-Sevier, former principal of the now-closed Robeson High School in Englewood. Meanwhile, Narain is challenging the LSC's decision. Under a 1999 amendment to the School Reform Act, a principal can ask an independent arbitrator to review and possibly overturn an LSC's decision. Narain has begun this process, which could take several months. While this has been done before, to date no principal has been successful in arbitration. This report was produced by City Bureau, a Chicago-based civic journalism lab. City Bureau reporters Emmanuel Camarillo and Amanda Tugade contributed reporting. Correction: This post has been amended to correctly reflect the name of selective enrollment school King College Prep. Chicago’s local school governance boards have waned since they began 30 years ago, and some say there are no repercussions for LSCs that break the rules.